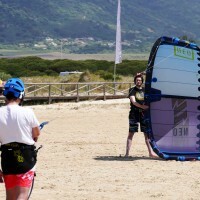 With the new offer Radical Kitesurf Classes Tarifa you can choose the best type of class you need! 3 hours KiteSurf lesson in group or 2h in private. The timetable of the surf classes can change due to weather and wind conditions. Late session start at 20.00 with a 60 minutes of Hatha Yoga. After the free Yoga meeting you can decide to rest with sweet Chai Tea or taste one of our Vegan and Vegetarian specialities prepared by our Italian Chef Cristian Chizzola in the Natural Surf Bar. We are a Surf Club located in Tarifa Spain. We offer accomodation, yoga, surf and kitesurf lessons and many other activities. Accomodation in private villa with shared room, bar, swimmingpool, terrace, organic garden and more. We are 3km from Tarifa's town and 5 min walk from the wonderful beach of Los Lances Norte.